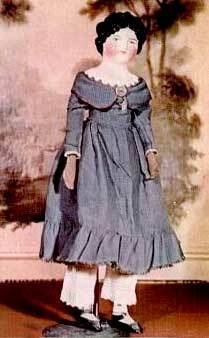 The mid-19th century poured wax doll was made in England. Skilled doll makers such as Montanari and Pierotti pioneered poured wax dolls. The Montanari establishment was a flourishing attraction at the Great Exhibition of 1851. These playthings are indeed very beautifully modelled, the hair inserted into the head, eyelashes, and eyebrows. Moreover, a Victorian wax doll dressed by Queen Victoria’s eldest daughter, the Empress Frederick of Germany (christened Princess Victoria, the Princess Royal), sold at Bonhams, Knightsbridge for £4,080, as part of a Fine Dolls and Teddy Bears sale. 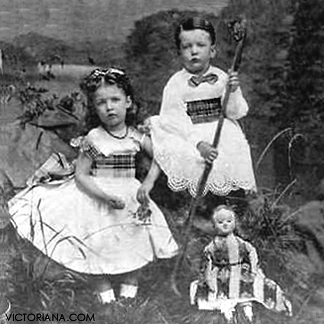 Boy and girl pose with antique doll, c 1860s. 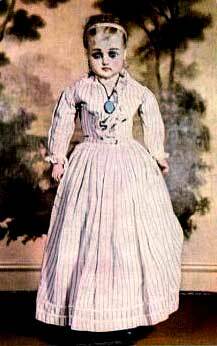 Antique dolls and their doll clothes from 1872 are featured. 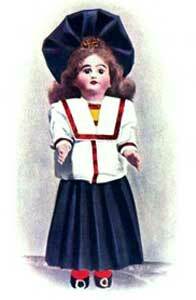 The baby dolls have long robes of white muslin or spotted lawn, lace caps, and merino cloaks with double capes; one of these appears in the arms of a French nurse, arrayed in white cap, folded neckerchief, and apron. Most attractive of all is a bride with long white silk dress, illusion veil, orange flowers, pearl jewelry, and bonny brown hair rolled hack in Pompadour style. 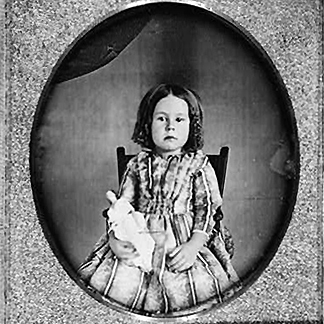 Little girl sits with antique doll and buggy, c 1860s. Description of the popular Antique Dolls for the holiday season in 1881. One featured doll, more valued for its durability than beauty, had the doll head cut from a solid piece of wood, and this wooden head could be banged about without breaking. The head moved, and the body, which was also of wood, was painted as the fine French dolls were, Some of these antique dolls voiced "Mamma" and "Papa." In small sizes, such dolls, without the speaking attachment, were $1.25, and these were chosen for children whose bump of destructiveness is large. The well-known indestructible heads, with short hair of sheep's wool that could wash and comb, were made with prettier faces than when first introduced. Doll clothes patterns from the Butterick Publishing Co. To market their products, Butterick introduced two fashion magazines, the Ladies Quarterly of Broadway Fashions and the Metropolitan in the 1860s. Both magazines sold the Butterick’s pattern designs by mail order. In 1873, Ebenezer Butterick launched The Delineator, which, by the turn of the century, became one of the most popular women's fashion magazines in America. In addition to men, women and children’s clothing patterns, The Delineator also offered detailed doll clothes patterns to make an extensive and complete doll’s wardrobe. 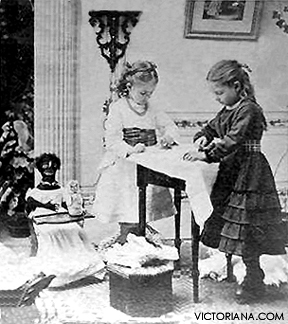 Two girls play with antique dolls, c 1870s. A favorite fictional story character and vintage doll was Raggedy Ann. 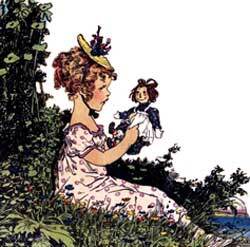 This mischievous rag doll and her enchanting toy friends were introduced to young readers in 1918 by author Johnny Gruelle (1880-1938). Raggedy Ann always has a warm and optimistic outlook and a calm approach to difficulties. Although the Raggedy Ann books were successful, the dolls became more popular. The earliest dolls are marked with the patent date of September 7, 1915, on their back torso. A sequel to the first book, Raggedy Andy Stories (1920), introduced the character of her brother, Raggedy Andy, dressed in sailor suit and hat. 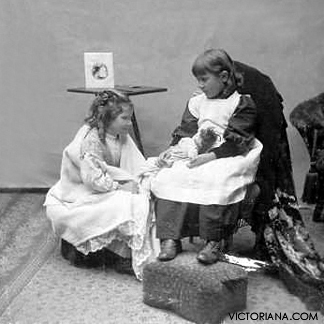 Two girls play with antique doll, c 1890s. Child's Eye View exhibit featured antique toys including antique dolls. Dolls have been popular toys for girls through the centuries. In this exhibition, Gretchen was a cherished member of the Clymer-Rumford family. She was made in Philadelphia by the Greiner firm in the last quarter of the 19th century. Another special doll, made around 1790, came with an extensive wardrobe, including everything from shift and stays to gowns and hats. Probably made in England, the doll is made of wood with glass eyes, painted facial features and jointed limbs. Another exhibit at the V&A Museum of Childhood featured the antique doll face made from many different materials – rubber, prunes and mutton bones as well as the more usual cloth, wood, ceramic, plastic and wax. 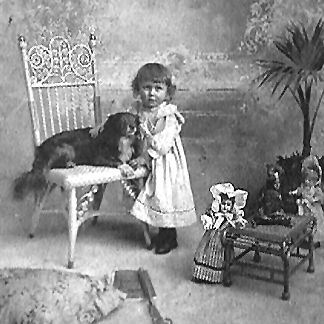 Toddler poses with antique dolls and dog, c 1890s. The Empress dressed the doll for a bazaar in London to raise funds for impoverished Germans in the city circa 1868, and it was bought by the financier Baron von Schroder. The doll wears a beautiful long white cotton and lace dress with a pink satin underskirt, layers of underclothing and a ribboned bonnet. 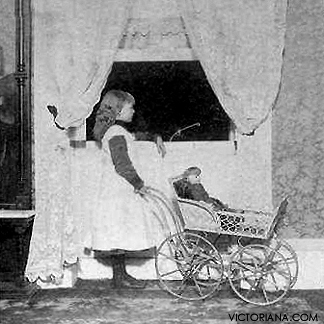 Girl poses with wicker carriage and antique doll. 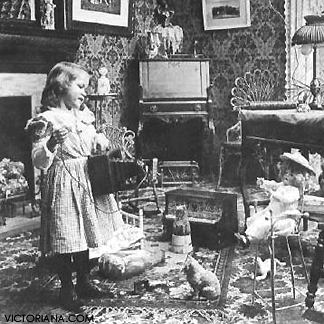 Throughout time, children have loved to play house, especially with an antique dollhouse. Make believe and role-playing was practice for real life. For hundreds of years, children have played with miniature replicas of a standard house. The Queen’s Dolls’ House at Windsor Castle is the largest, most beautiful and most famous dolls’ house in the world. Close-up photography of a vintage dollhouse provides intricate details of each room in the dollhouse allowing visitors a more intimate look at the lives of its residents. See items such as tiny chess pieces, glass heirlooms and the aquarium that holds the family goldfish Goldie, Wiggle and Dart. 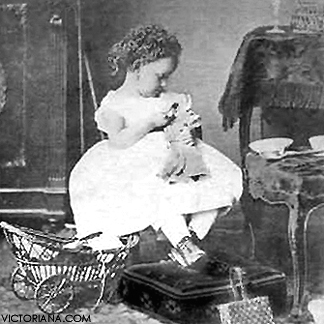 Girl plays with toys, including antique doll in highchair. Explore the offerings of entertaining toys for the young turn-of-the-century girl listed in an antique toy catalog. She could choose from dressed china or rubber dolls, including a German Nurse doll with a dressed baby in her arms, or "crying voice" dolls. For the dolls there was a perambulator, a doll swing, a rocking chair, or high chair. 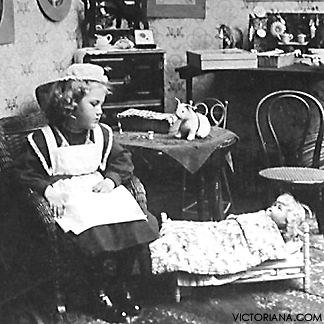 Girl plays with antique doll and doll bed, c 1890s. Antique collecting software allows collectors of antique and vintage dolls, doll clothes, dollshouses, and paper dolls keep a visual record of the appearance and condition of each of their treasured collectors items. Moreover it is easy to identify individual collection records at a glance with both detailed images and exact descriptions. Users can create as many collections as needed with a single copy of the software. 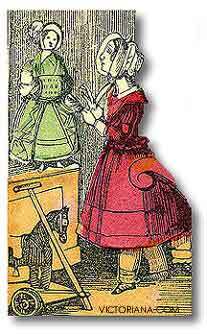 History of paper dolls in America beginning in the 1850s. America did not enter the paper doll manufacturing arena until the mid-19th century. Crosby, Nichols & Company of Boston printed the first paper doll in the United States in 1854 titled “Fanny Gray: A History of Her Life, Illustrated by Six Colored Figures. By the author of Cousin Hatty’s Hymns and Twilight Stories.” The first American book on paper doll making, Paper Dolls and How to Make Them, A Book for Little Girls, was published by Anson D. F. Randolph in 1856. The first magazine to print a paper doll grouping with costumes was the American women’s publication, Godey’s Lady’s Book. The November 1959 issue included a page of six figures of boys and girls for “the little girls who read Godey” to color, plus a page of hand-colored costumes to cut out. Only the front view of the figures was shown. 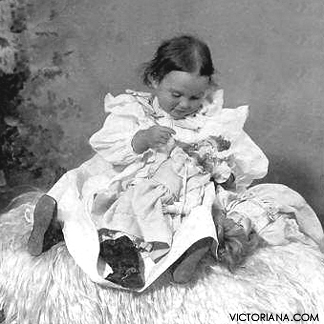 Toddler holds large antique doll, c 1890s. A story about an antique doll, a child's toy. I was soon drawn from my hiding place, and held at arms length by the loveliest little girl I had ever seen—her eyes blue as the sky above, masses of curling auburn locks around her temples — a mouth expressive of the most perfect sweetness and good nature — who can say I had not a sweet little mistress. 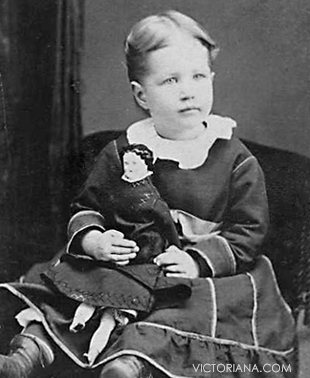 Toddler holds antique doll, c 1870. 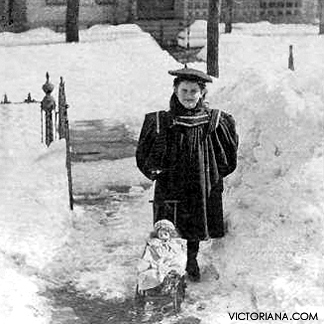 Girl walks in snow with antique doll and buggy, c 1890s. 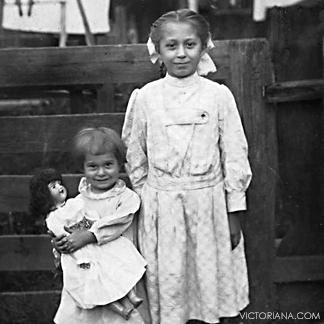 Young girl hugs antique doll half her size.